This statement, together with hundreds of others, is posted on the wall of the Community Center in the Cass Corridor where the Detroit Summer Collective hosts our community potlucks on the second Thursday of every month. Last fall , with the help of Cerveny Middle School students, we distributed cards asking this question at schools, libraries and local businesses around the city. The cards also depict scenes of block parties, swing sets and colorful houses with people planting flowers next to them, contrasted with pictures of gunfire and stick figures with x-ed out eyes. The urgency of these responses convinced us that when we celebrate Martin Luther King birthday on January 15 and his anti-Vietnam war speech throughout 2007 our attention must be focused on ending the war, both at home and abroad. We know that we have to end the war in Iraq. But we also know that protesting the war is not enough. As long as we lack real solutions and alternatives to poverty and hopelessness among young people in cities like Detroit, the U.S. military will continue to prey upon our communities, recruiting young men and women to fight senseless, unjust wars. But what are those alternatives? We don’t claim to have easy answers. But we believe that as a community, through our creativity and compassion, we can devise alternatives to military enlistment, and that these alternatives will also work towards ending violence in the streets. During 2007 our monthly potlucks will provide opportunities for Detroiters to explore these and other hard questions as an inter-generational community, putting the voices and visions of young people at the center. Co-hosted with Finding Alternatives to Military Enlistment (FAME), our aim at this potluck is to break the silence around the wars being waged on the people of Iraq, Palestine, Afghanistan AND the youth of our city. 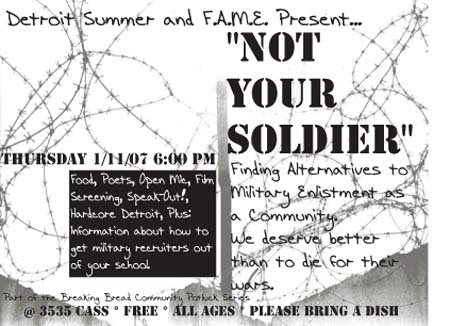 We will also be celebrating FAME’s recent success in obtaining the unaninmous decision of the Detroit Public School Board to allow FAME entry into all schools where military recruiters are stationed. Please bring a dish to pass!